You have a family’s worth of bathroom towels, products, prescriptions, hair accessories, bath toys, hairdryers, cleaning supplies and more. Create a place for everything—and keep everything in its place—with bathroom vanity pull-out hampers, divided drawers, even an appliance garage. 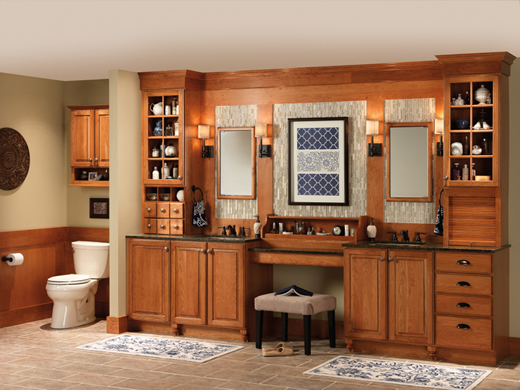 These bathroom storage solutions are shown here in Classic Somerton Hill in Cherry Amaretto finish, paired with a granite countertop and Delta® faucet. Click on the dot to view details of each storage accessory.